How do I participate in the Tiered Spender? You participate in our Tiered Spender by buying anything off of our Web Mall or in-game Cash Shop. The Tiered Spender is based off of items purchased and not how much AP you recharge for. How do I know when a Tiered Spender event is happening? Underneath your AP amount that you have to spend there will be a bar underneath it that displays how much AP you have spent so far (if any) and how far you are into it! 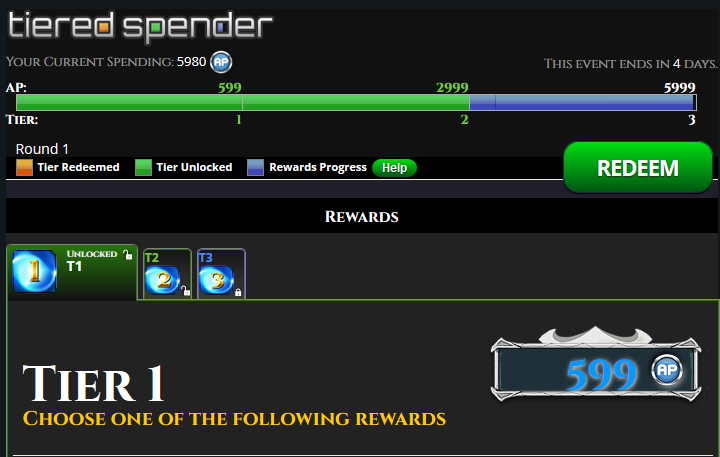 If you look to the left, there is a tab for Tiered Spender, when expanded you will see all the Tiered Spenders and what the rewards are for each Tier. Underneath the Tiered Spender logo you will see how much AP you have currently spent! To the right of this, is how long you have to participate in this Tiered Spender. The Green color signifies tiers that you have unlocked and can receive rewards for, blue signifies how far you are until you hit the next tier. This signifies that you have redeemed the items for those tiers, and in some cases you can continue and repeat the tiered spender and redeem even more rewards! How long do I have to redeem rewards? The Echo of Soul team recommends claiming the Tiered Spender rewards within 24 hours after the Tiered Spender has ended at the latest. Of course you can redeem your rewards at any time while the Tiered Spender is still active!